"Hamlet" is probably William Shakespeare's best-known work, if not one of the most-read works of literature in the world. The tragedy of a Danish prince being undone by his own procrastination has been studied by audiences, actors, academics, and students alike over the centuries, with lines from the play having become a permanent part of the vernacular of popular culture. Each new generation has also sought to re-interpret this seminal work within their own worldview. For example, quotes and references to "Hamlet" have appeared, of all places, throughout the "Star Trek" franchise, with the unabridged "Hamlet" having been recently published in the 'original Klingon'. Given the popularity of the play, it is not surprising that there have been over forty filmed versions of the play to date, a list that is now joined by the 'modern' version from director Michael Almereyda, the first filmed "Hamlet" of the new millennium. Though Almereyda's has updated the setting of his "Hamlet" to modern-day New York, the basic story should still be recognizable to those moviegoers familiar with the play. Instead of King of Denmark's castle, the action takes place in the office towers of Denmark Corporation, a powerful media conglomerate that is under a hostile take-over bid by outside interest Fortinbras (Casey Affleck, brother of Ben). To prick and sting her. 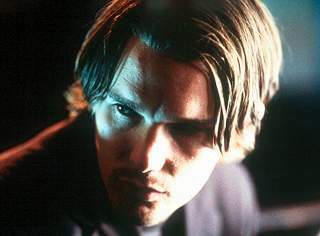 Young Hamlet's (Ethan Hawke of "Reality Bites") appetite for vengeance is whetted by the ghost of his father (Sam Shepard of "Snow Falling on Cedars"), the rightful 'king' and CEO of Denmark Corporation, who has been slain by his younger brother Claudius (Kyle MacLachlan of "Time Code"). Unfortunately, Claudius has subsequently married Hamlet's mother, Gertrude (Diane Venora of "The Insider"). Meanwhile, Hamlet must also contend with the meddling of Claudius' closest advisor Polonius (Bill Murray of "Cradle Will Rock") and the efforts of his close friends Rosencrantz (Steve Zahn of "Happy, Texas") and Guildenstern (Dechen Thurman, brother of Uma) to spy on him. Hamlet must also deal with his love for Polonius' daughter, Ophelia (Julia Stiles of "Down to You"), whom he unsuccessfully tries to protect from the ensuing violence. 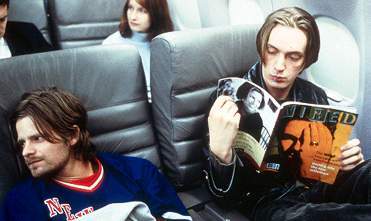 Unfortunately, despite assistance from his loyal friend Horatio (Karl Geary), Hamlet ends up being crippled by indecision and procrastination, which leads to tragedy in the film's final act. Is but to whet they almost blunted purpose. But look, amazement on thy mother sits. O, step between her and her fighting soul! Updating a Shakespeare play to a contemporary setting is nothing new, and some updates are much more successful than others. Perhaps the most successful in recent years was Baz Luhrman's "William Shakespeare's Romeo & Juliet" from 1996, which successfully recontextualized the tragic romance into modern-day 'Verona Beach' while still retaining the passion and energy of the original. Ian McKellan also had his hand in updating the Bard's work in 1995 with "Richard III", which transposed the play to a fascist England in the 1930s, and though it was not entirely successful, it was memorable nonetheless. Unfortunately, Almereyda's "Hamlet" will be remembered as one of the less successful ones, with its uninteresting interpretation of the protagonist, some poor casting choices, and lethargic presentation. Though canst not then be false to any man. Depending on the production, the unabridged play runs at almost four hours, as did Kenneth Branaugh's filmed version from 1996. In the case of Almereyda's vision, "Hamlet" has been trimmed to a multiplex-friendly two hours, the result of jettisoning and condensing several scenes, including the gravedigger scene ("Alas, poor Yorick...") and the scene that contrasts the actions of Hamlet and Fortinbras. To quit him with this arm? In the transposition (or bastardization, depending on who you talk to) of the play to modern times, Almereyda has certainly taken some liberties, some of which border on parody, that are certain to cause some outcry among the Shakespeare purists. In this version, Hamlet leaves Ophelia a message on her answering machine to "get thee to a nunnery", Ophelia calls up MovieFone prior to Laertes' departure, the ghost first appears on a security video, and the play-within-a-play "The Murder of Gonzago" becomes a Hamlet-directed student art film entitled "The Mousetrap". Unfortunately, many of these touches are a source of inadvertent humor, and like the staging of many of the scenes, reveal little about the characters themselves or the thematic undercurrents of the play. However, there is one key scene that actually does work, though it has been derided by a number of critics-- the "To be or not to be" soliloquy that takes place in a Blockbuster video store. Yes, it sounds cheesy, but it serves as an interesting metaphor, since young Hamlet is perusing the 'action' aisle of the store while he ponders his procrastination (or, in other words, his inaction). This version of "Hamlet" is also noted for being the first to cast an actor under the age of thirty in the role. 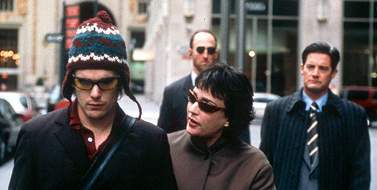 With his fashionable rave wear and unkempt appearance, my guess is that the Ethan Hawke version of Hamlet is supposed to reflect the disaffected Gen-X demographic who feel paralyzed in today's world of tumultuous technological and societal change. Unfortunately, Hawke has no commanding presence in this production, and he is often seen brooding and sullen, possessing little energy or appeal to capture the audience's interest. Instead of wrestling with his internal conflict of action vs. inaction, this version of Hamlet spends most of his time brooding, as if about to fall asleep. The rest of cast varies in quality. On the low end of the scale is Stiles, who is unconvincing as the lovelorn Ophelia. MacLachlan and Venora, as Claudius and Gertrude, are slightly more credible, yet hardly memorable, as is Shepard, playing a ghost that haunts a Pepsi machine. 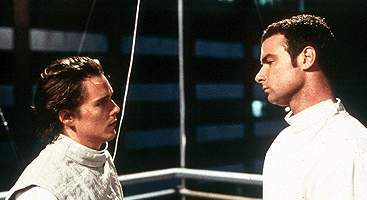 However, Schreiber manages to deliver one of the better performances in the film as the rash and hotheaded Laertes, while Murray manages to successfully convey Polonius' long-winded and scheming nature. This latest updating of "Hamlet" is built on an interesting concept, though it seems that Almereyda didn't go deep enough when it came to staging the scenes or understanding the characters. While the film is certainly blessed with sumptuous visuals, including what is probably the first use of 'Pixelvision' in a feature film production, and Carter Burwells' stirring musical score, the essence of "Hamlet" is conspicuously absent, leaving little more than an intellectual curiosity. Images courtesy of Miramax Films. All rights reserved.